This indicator is no longer being regulary updated. No more updates will be done. The indicator shows the annual quantities of waste oils generated, collected and used as fuel. - other mineral or synthetic waste. The exception are waste oils which are mechanically treated by the producer at a facility at the location of their generation in such a manner that they can be reused for the same purpose within 12 months following their generation at the latest (Decree on the disposal of waste oils, Official Gazette of the Republic of Slovenia, no. 25/08). To improve the existing system of waste oil management in Slovenia, i.e. to set up additional facilities to accept and collect waste oils with the purpose of increasing the recorded level of collected waste oils from the current 35% to 50% of quantities generated or, conversely, with the purpose of achieving the annual quantity of collected waste oils greater than 30% of lubricating oils sold per year. Slovenia has been adhering to the basic system of collection, recovery and disposal of waste oil since 1998. The main foci and provisions regarding the programme of waste oil management are stipulated in our legislation, in particular in the Decree on the disposal of waste oils, which is harmonized with the EU directive on the disposal of waste oils. Waste oils cannot be mixed with other hazardous waste and substances. Producers of waste oil are obliged to deliver the oil to collection services unless they hold permits for disposal or recovery. They are obliged to set up suitable delivery points. Waste oils must be deposited at collection centres, suitable delivery points or collection facilities of waste oil collectors. Collection may only be carried out by holders of a relevant permit issued by the ministry. Each collector must have a collection centre and must ensure either recovery or disposal of waste oils. Recovery is the preferred choice if technically feasible and if its cost is not unreasonably higher than the cost of disposal. One of the forms of recovery is the utilisation of waste oils for energy – coincineration in accordance with recovery procedure R1. A detailed analysis of waste oil management in Slovenia is conducted only for 18 classification numbers of waste oils without substantial water content. 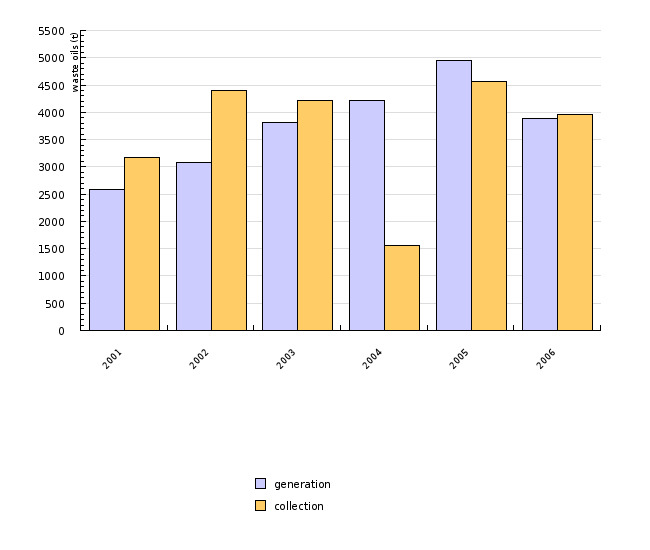 Since 2004, Slovenia has had 10 registered waste oil collectors. The average quantity of waste oils generated and collected has been on the rise. One of the reasons for the increased quantities in 2005 may be market conditions. The discrepancies between the quantities generated and collected in individual years are attributed to an incomplete record of liable entities, particularly the generators of waste oils (2000 was the first reporting year in compliance with the provisions in the Rules on the management of waste). Furthermore, generators of less than 20 kg or 5 kg of waste oils were also not required to report (amendment of the Rules on the management of waste, Official Gazette of the Republic of Slovenia, no. 13/03). The quantity of waste oils collected in a specific year may be somewhat higher than the oils generated due to prior storage of the oils. Records by the Environmental Agency of the Republic of Slovenia show that most waste oils are used as fuel. The data are derived from a database on the management of waste at the Ministry of the Environment and Spatial Planning - Environmental Agency of the Republic of Slovenia as well as the annual reports submitted to the Environmental Agency of the Republic of Slovenia by the collectors of waste oils. Data on generation of waste oils are gathered as per the Decree on waste management (Official Gazette of the Republic of Slovenia, nos. 34/08). (Up to 2008 data were gathered on Rules on the management of waste (Official Gazette of the Republic of Slovenia, nos. 84/98, 45/00, 20/01, 13/03 and 41/2004-EPA-1)). The Decree stipulate that each generator of more than 5 kg (20 kg up to the year 2002) of hazardous waste per year must submit a report on the waste generated and its management. The data on collection were gathered as per the Rules on waste oil management (collection, recovery and disposal) (Official Gazette of the Republic of Slovenia, nos. 85/98 and 50/01) and from 2008 the data are gathered as per the Decree on the disposal of waste oils (Official Gazette of the Republic of Slovenia, no. 25/08) . These reports must be submitted to the Environmental Agency of the Republic of Slovenia by March 31 of the current year. According to the Decree, anyone who performs an activity which generates waste oils must ensure the containment and storage of such oils in an environmentally safe manner, then deliver the oils to a qualified collection service which will further process or dispose of them. Reports on the generation of hazardous waste are entered into a database. Reports on the collection of waste serve as a basis for the preparation of an annual report on the collection of waste oils. The content of each completed form on the generation of hazardous waste is examined. The content of reports on the collection of waste oils is verified by the Environmental Agency of the Republic of Slovenia. The Agency also checks whether all the liable entities have submitted their reports and obtains those that are missing.